Stories and fiction are not synonymous. Facts can mislead, and frequently do. Fictional stories can hold meaningful truths. Data can distract us. Whether we’re reading stories online or writing for others, we need to keep a few distinctions clear in our heads: stories vs. fiction, truth vs. facts, fibs vs. frauds. For many years, I thought that as a determined nonfiction writer, I didn’t have to worry about telling stories. By avoiding storytelling, I missed out on a powerful means of explaining complicated ideas, holding readers’ interest, and connecting more deeply with others. Stories belong to all kinds of writing—even nonfiction. Business writers can use personal anecdotes, customer stories, and brand stories. Nonfiction authors might create fictional scenarios to illustrate key concepts. As long as the gist of the fictional tale is true, its usage is legitimate in the nonfiction context. Facts are data points – ideally they point us to larger truths. The world in which we live is enormously complex. Just as our brains filter the inputs from our eyes to construct a visual reality, so do our minds filter the facts we encounter, fitting them to our world views. I may choose to ignore facts to avoid cognitive dissonance (the discomfort of encountering evidence that clashes with my current beliefs.) I may not even be aware of this filtering as it happens. If this is true, you will not change my mind by throwing more facts at me. Facts and data are critical, but not enough. We have to find the truths that fit those facts. Ideally, writers help readers arrive at their own conclusion through the careful and thoughtful combination of fact and fiction, story and truth. 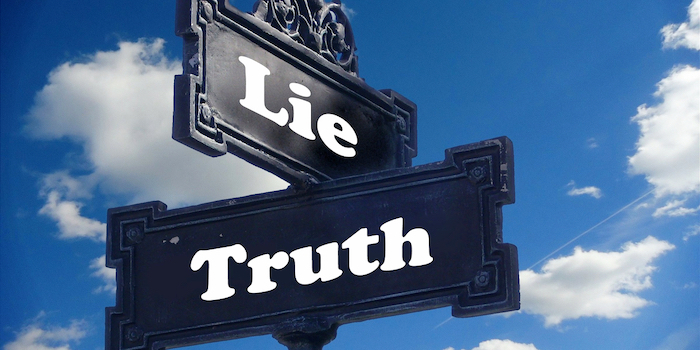 In All Marketers are Liars, Seth Godin distinguishes between fibs and frauds; fibs are “white lies” meant to help us arrive at something useful. Godin writes that “fibs are lies that make the story come true.” Aspirational brand stories might be fibs, if the brand acts on those aspirations. Frauds are deceptions crafted for nefarious purposes. Once revealed, frauds anger us through their falsehood. Theranos’ founding story was a compelling one: Elizabeth Holmes had a fear of needles and wanted to make sure that others with he same problem wouldn’t avoid necessary blood tests. The founding story became the brand story, retold again and again: medical tests requiring only a few drops of blood. At its outset, this brand story was true in an aspirational sense. When reality couldn’t match up, however, it appears to have strayed into the area of fraud. (The criminal case is still pending.) Facts and fiction eventually must make peace with each other. Tell stories, but be careful of the stories you tell. And if you write in business, politics, or other nonfiction venues, make sure that your fictional stories express a meaningful truth.